Interested? Want to Apply? Click Above. Serve on local boards and help with fundraising, marketing and community awareness programs. Be the face of New Hope in your community and ensure we are serving your community well. Assist with volunteer recruitment, placement, record keeping and recognition. Assist the fundraising team as they research, write and execute grants. Assist the marketing department by writng articles and work with local/national publications and media to tell the New Hope story to highlight our people and programs. Assist the marketing and screenprinting departments with the layout and design of vector art, flyers, posters and brochures. Work on scheduled internal and external publications for print. Coach our Special Olympians during activities and local sports opportunities. Provide presentations about New Hope programs and services in the community. Be an online advocate and spread the word about New Hope across social media outlets. Work on computers or assist with tasks that involve computers and IT support. Assist the marketing department in visually telling New Hope stories in a compelling way. Support our building and grounds with your specialized skills. Have fun while supporting fundraising and special events. Do what friends do... hang out, call each other, joke with each other, take a walk, make a fuss over each other on birthdays, introduce each other to new friends... When you adopt a buddy it's a great way to increase your social network while making a difference in the life of a person with a disability. Do you love to make pizza, bake things, or decorate cookies? Are you the creative sort who loves stamping, art projects and all things crafty? Maybe you're the type who likes to play cards, put together puzzles, play board games, or shoot hoops... Then again, you might be pretty good at playing a musical instrument... Whatever talent you may have, we would love for you to share it one-on-one or in a group setting... However you're comfortable. Call us today to share your talent with New Hope! Are you a shutterbug? Do you love to take movies? Help us tell our amazing stories about New Hope Center, about our programs, our services and about the people with disabilities who we serve in pictures and videos... We're always in need of people who like to take pictures and video, both at our center and during community events. Youth groups and schools, elementary through college, can engage their members by supporting New Hope services or starting a New Hope Youth Club. These opportunities allow youth to support New Hope's mission by volunteering through service projects or fundraising efforts. One or more individuals available year-round to support NHC on-site micro-enterprise, development and marketing departments, in graphic arts and digital design for silk-screening, sublimation printing, embroidery, traditional print, and online. 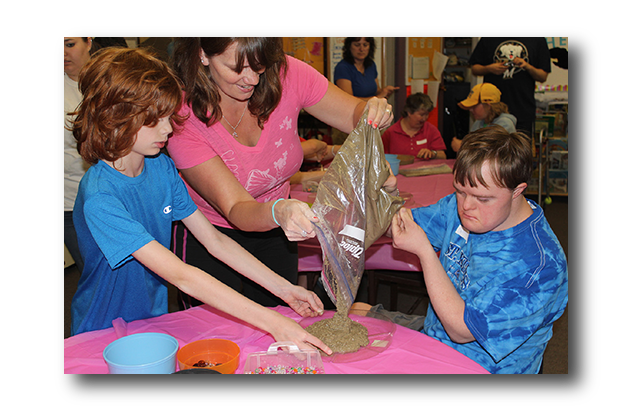 New Hope Center is a trusted provider and passionate advocate for people with disabilities in East Central Wisconsin. Volunteer assistance is needed in graphic arts and digital design. The ideal volunteer should be able to provide multiple examples in work they’ve produced from relative education or experience and be talented and creative in the visual and/or media arts. Volunteers having experience in any of the duties, responsibilities, and qualifications listed below are needed. Take direction well, juggle projects with changing priorities, and be a self-starter. Develop graphic elements efficiently and precisely with attention to detail. Help deliver cutting edge design visuals for product development and marketing materials for use in print, online, packaging, and collateral pieces. Be a team player with a positive attitude willing to contribute to task success. Comply with internal and partner processes and style guides. Research projects as directed and be able to present a summary and an opinion of the findings. Report to administrative and operational staff as assigned. Positive attitude, willingness to succeed. Solid layout skills and an artistic “eye”, be able to translate trends into assignments. Passion to learn, accept responsibility, and optimize the benefits of this volunteer position! Orientation and ongoing volunteer coaching. Work directly with the CEO and Development and Marketing Director. Days/times as scheduled by the administrative operational staff. The projects are interesting and fun, as are the people working on them. We need a special volunteer or combination of volunteers to improve our effectiveness with a professional touch in graphic arts and digital design. One or more individuals available year-round to provide general department administrative assistance and help promote NHC through a variety of supportive and creative marketing efforts. New Hope Center is a trusted provider and passionate advocate for people with disabilities in East Central Wisconsin. Volunteer assistance is needed to promote NHC and its initiatives. Volunteers having experience in any of the duties, responsibilities, and qualifications listed below are needed. Assist with writing, editing and publishing press releases, media advisories, PSA’s, community calendar notices, publications, blog, Facebook and Twitter postings, and other materials promoting New Hope Center. Update Facebook, Twitter and website as instructed. Assist with the creation and distribution of publicity for NHC functions, campaigns and special events. Contact local media and businesses to generate support for programs, campaigns, and events. Assemble and record press clippings, past and present. Help to prepare marketing reports. Participate in NHC marketing staff meetings (weekly). Computer/typing skills using MS Office Suite: Word, Outlook, Excel, PowerPoint; Adobe Creative Suite: Illustrator, InDesign, Photoshop; Internet; Facebook, Twitter and other Social Media tools. Comfortable promoting NHC members and activities. Days/times as scheduled by the development and marketing director and operational staff. The projects are interesting and fun, as are the people working on them. We need a special volunteer or combination of volunteers to improve our effectiveness with a professional touch in publicity. One or more individuals available year-round to provide on-going activities assistance. New Hope Center is a trusted provider and passionate advocate for people with disabilities in East Central Wisconsin. Volunteer assistance is needed to assist our members in a wide range of activities at various hours. Volunteers having experience in any of the duties, responsibilities, and qualifications listed below are needed. The volunteer determines the amount of time they are able to give. Times needed vary throughout the day and day of week. Aides may help in various ways both at the group home and in the community. Examples are: Assist with scheduled swimming at the Community Center, visits to the library, short walks, cooking or baking, musical activities, games and puzzles. Dependably to help at time required. Positive attitude, enjoy working with people. ongoing periods of standing, walking, bending and possible lifting. Orientation and ongoing volunteer coaching. Work directly with the administrative staff. Days/times as approved by the administrative and operational staff. Our projects are interesting and fun, as are the people working on them. We need a special volunteer or combination of volunteers to support the work in these group homes. Screening and background checks are completed on all volunteers. One or more individuals available to provide painting assistance. New Hope Center is a trusted provider and passionate advocate for people with disabilities in East Central Wisconsin. Volunteer assistance is needed to assist in painting at our facilities. Volunteers having experience in any of the duties, responsibilities, and qualifications listed below are needed. Painters may help in various ways at our apartments, group homes, and at our center. Work directly with the administrative and operational staff. New Hope Center is a trusted provider and passionate advocate for people with disabilities in East Central Wisconsin. Volunteer assistance is needed to answer phones, transfer calls, page individuals, and greet visitors. Volunteers having experience in any of the duties, responsibilities, and qualifications listed below are needed. Times needed may vary throughout the day and day of week. Dependably to help at times scheduled. Clear voice and friendly phone manner. Patience and ability to multi-task. Agree to a minimum 6-month commitment. One or more individuals available seasonally during the winter months to provide curbside assistance each weekday morning from 7:45 am to 8:15 am until spring arrives to assist in getting our members off from busses and safely into the building. New Hope Center is a trusted provider and passionate advocate for people with disabilities in East Central Wisconsin. Volunteer assistance is needed to assist our members in departing buses safely. Volunteers having experience in any of the duties, responsibilities, and qualifications listed below are needed. ongoing periods of standing, walking, bending and lifting. Days/times as scheduled by the administrative and operational staff. Our projects are interesting and fun, as are the people working on them. We need a special volunteer or combination of volunteers to support the work in this department.